“Phyllis Curtin, an American soprano celebrated as a champion of new music, a mainstay of the New York City Opera in the 1950s and ’60s, was noted for the purity of her voice, the sensitivity of her musical phrasing and the crystalline perfection of her diction. On the opera stage and in recital, she gave the premieres of dozens of works by 20th-century composers – ‘more first, and last, performances than any singer in history’, as she was fond of saying, ruefully. But she sang many works with staying power, including music by Benjamin Britten, Ned Rorem and the American composer Carlisle Floyd, for whom she created the title role in SUSANNAH, his most famous opera, in a performance at Florida State University in Tallahassee in 1955. In the standard repertoire, Ms. Curtin was widely praised for her Mozart - she sang all of his major heroines over time - and for the title role in Richard Strauss’ SALOME. Her other notable roles included Violetta in LA TRAVIATA and Alice Ford in FALSTAFF, Ellen Orford in Britten’s PETER GRIMES; the title role in Darius Milhaud’s MÉDÉE; and Cathy in Mr. Floyd’s WUTHERING HEIGHTS, a part she created at the Santa Fe Opera in 1958. Ms. Curtin also sang at the Metropolitan Opera, the Lyric Opera of Chicago, the Vienna State Opera, Covent Garden and La Scala. She appeared in concert with the New York Philharmonic, the Boston Symphony Orchestra, the Philadelphia Orchestra and other major ensembles. In later years she taught voice at Yale and Boston Universities and at Tanglewood, where she held a sought-after master class each summer for more than half a century. Though Ms. Curtin’s singing was esteemed by critics and opera aficionados, she remained less well known than contemporary sopranos like Beverly Sills and Joan Sutherland. She performed with the Met just 35 times in the 1960s and ’70s, and recorded far less than many of her peers. 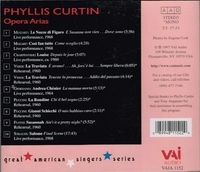 Writing in The New York Times in 1998, Anthony Tommasini described Ms. Curtin as an ‘estimable American soprano, who has achieved notable success and respect throughout the field but never quite the recognition she deserves’. The reasons for this seem to reflect the difficulties faced by many American opera singers of Ms. Curtin’s era, when a European background was considered the sine qua non for landing contracts with major United States companies. What was more, as Ms. Curtin told it, her career was hindered by a set of backstage machinations as Machiavellian as anything in opera. She envisioned herself as a recitalist – ‘a song-singer’, she liked to say - but fell into opera early. As a student at Tanglewood in 1946, she sang a small role in the United States premiere of PETER GRIMES, under Leonard Bernstein. Ms. Curtin gave her New York recital début at Town Hall in 1950 in a characteristically eclectic program that featured songs by Mozart, Fauré, Ravel, Mussorgsky and several Latin American composers. Reviewing the performance, THE NEW YORK TIMES said: ‘Miss Curtin’s voice is altogether lovely in quality, and is used with equal assurance throughout its entire range. But her concern was so exclusively with communication that one was conscious only of the music itself’. She made her first appearance with City Opera in 1953, singing three roles in the United States premiere of THE TRIAL, an adaptation of Kafka’s novel by the Austrian composer Gottfried von Einem. The début was well received, as was her subsequent work with the company, but it was not until City Opera staged SUSANNAH in 1956, with Ms. Curtin again in the title role, that her reputation was truly made. Based on the biblical story of Susanna and the Elders, the opera, set in rural Tennessee, centers on a community’s condemnation of a sensual young woman and the tragic consequences that ensue. It went on to become one of the most frequently performed American operas, and Susannah became the character with which Ms. Curtin was most closely identified. Yet operatic superstardom eluded her. She may have been hindered by her voice which, though almost universally praised for its purity, was not as immense as large opera houses can demand. She may have been tarred, too, by her association with 20th-century music, typically a hard sell to audiences. Ms. Curtin made her Met début in 1961 as Fiordiligi in Mozart’s COSÌ FAN TUTTE. (‘Now Phyllis Curtin is at the Met, where she should have been a long time ago’, THE NEW YORK HERALD TRIBUNE wrote.) But after that, the company’s imperious general manager, Rudolf Bing, engaged her only occasionally. Even more painful than her dealings with the Met was a rupture with City Opera in 1966, which Ms. Curtin called ‘the only heartbreaking thing in my career’. The company had been planning to stage Handel’s JULIUS CAESAR, with the role of Cleopatra going to Ms. Curtin. Then Ms. Sills, in her 30s and a City Opera regular though not yet a huge star, demanded the role for herself. She threatened to rent Carnegie Hall and present a competing program of arias from the opera if the company did not relent. The company relented. ‘That’s when the knife went into my back’, Ms. Curtin told THE TIMES in 1972. ‘After my life at the City Opera, which had always been successful for me and the company, I simply couldn’t believe that my family would do that to me’. Ms. Sills, who later said she regretted the episode, sang the role to immense acclaim. It was said to have made her career. Ms. Curtin, who continued to perform well into her 60s despite having developed painful rheumatoid arthritis in her mid-40s, taught at Yale during the 1970s and early ’80s. In 1983 she became the dean of Boston University’s School for the Arts, a post she held until 1991, when she retired from the deanship but continued teaching there. Starting in the mid-1960s, she taught for 51 years at Tanglewood, where her students included the future opera stars Dawn Upshaw, Cheryl Studer and Simon Estes.